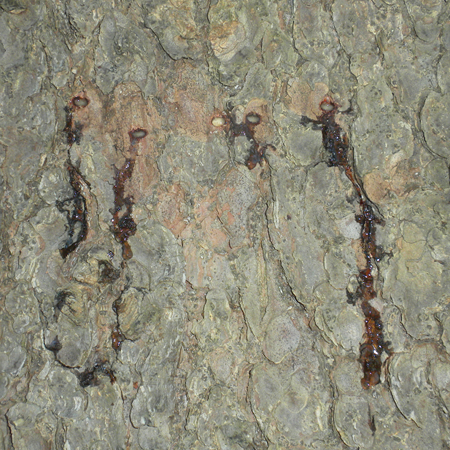 Sapsuckers are small woodpeckers that primarily feed on tree sap, as well as the insects attracted to (and stuck in) the sap. They are bigger than a Downy Woodpecker (Picoides pubescens) and smaller than a Hairy Woodpecker (Picoides villosus). 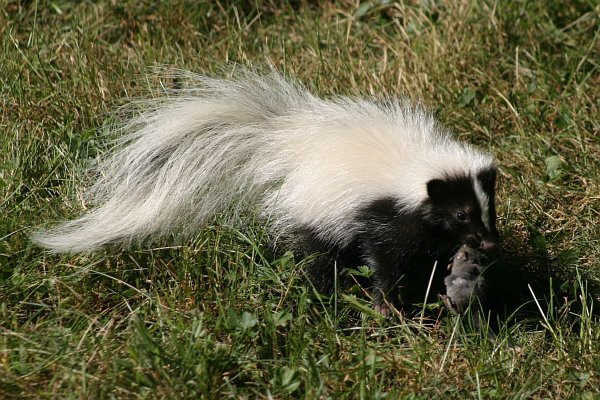 This was the first time I had seen one in my yard. Honey Bee on Goldenrod, Apis mellifera on Solidago sp. 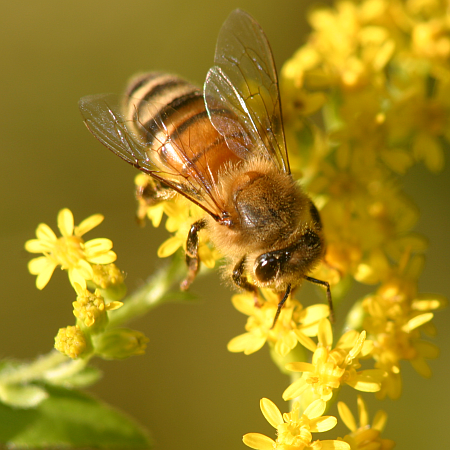 Interesting fact: There are about two dozen subspecies of honey bees. You can find out a lot more information about honey bees in this Wikipedia article. This is one of my favorite plants, and one I remember being fascinated with when I first encountered it as a child. Growing up, behind our house was “The Woods”. This was really a mix of pine and young oak as well as an abandoned field. If you went far enough (a few hundred yards), there was a low-lying wetland with a creek running through it. I first saw this plant on the edge of the field. It was starkly different from anything around it: large grey-green leaves that looked like they were cut from felt. Years later I learned that what I had seen was the first year “basal rosette” of a common mullein. In its second year, it shoots a spike up with yellow flowers that open a few at a time. They can easily reach 6′ and sometimes they branch into many flower heads – all pointing up. 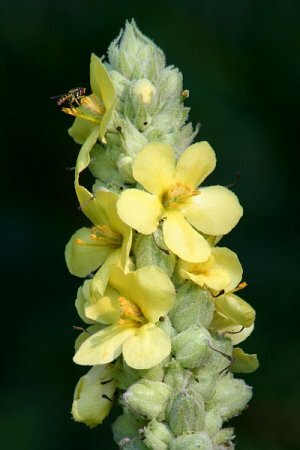 Today when I mow the lawn, I carefully maneuver around any mullein I see – remembering the sense of wonder I had when I first discovered one in “The Woods”. I was outside the other night looking for any interesting bugs that might be out when I ran accross someone else doing the same thing. This was quite exciting because this is the first frog I have seen in my yard. 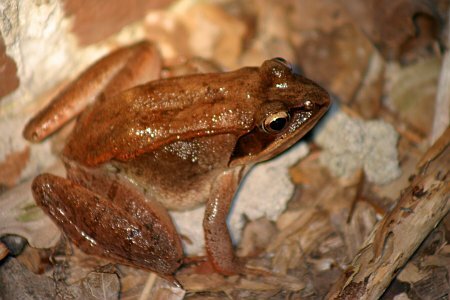 Wood Frogs are the only frog found north of the Arctic Circle. In the winter they actually freeze. Come spring, they thaw out. Quite a while ago, I created a web site called Nature In My Yard. It was technically a blog, but I had written it myself. The problem was I spent a lot of time adding features, and not much time on content. I didn’t want to add more content until the features were finished. I didn’t add more features because nobody read it (due to the lack of content). 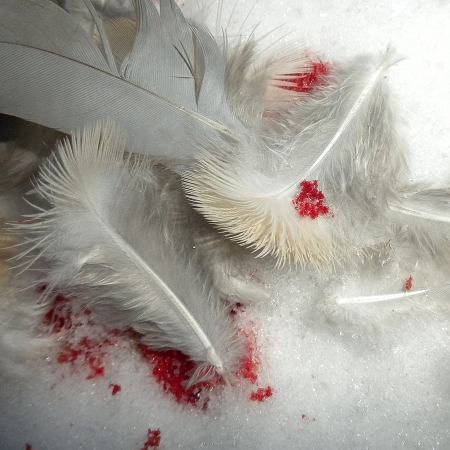 Well, now there is no excuse for not writing content, because I have installed WordPress blogging software – and although it is not exactly what I had before, I can focus on the original purpose of Nature In My Yard: discovering the nature found in my own yard. So enough about this boring drivel about the software behind it – let’s discover something!